I have recently gotten to a point on Twitter where I’m following so many people I can’t keep up. I feel that Twitter really needs to add a feature allowing us to put followers into groups for filtering. I have local friends, Lifestreaming users, other cool folks I follow, and I can’t keep up with my stream anymore. Also to make it usable for me, they would have to include that feature in the API and it would need to be supported in my favorite client Twhirl. I did remember reading about Crowdstatus on Webware the other day, and although it doesn’t offer what I want, I decided to check it out. So I decided to have a little fun with it. 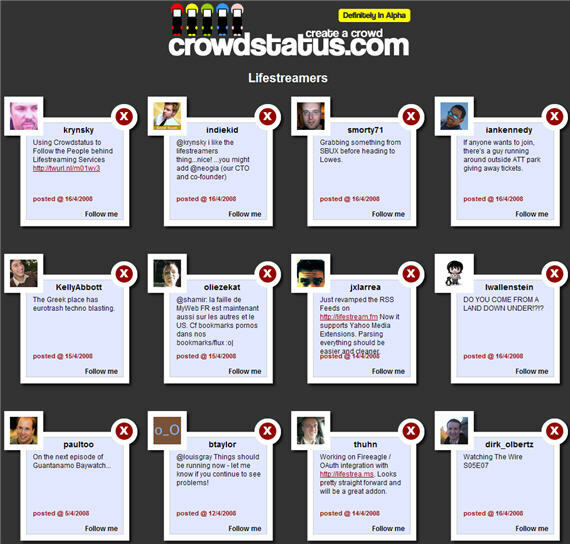 I created a group of Twitter users that are the people behind many of the top Lifestreaming services on the web. I also decided to add myself to the group for good measure. If you are a someone who is a founder or manager of a Lifestreaming service and feel you should be added, let me know. Hey Mark… Thanks for the add. Hey Mark, thanks a lot for putting me in this line up. I honestly feel like in the early beginnings of something that’s gonna be real big. It’s great to be part of the lifestreamers crowd and I’m very much looking forward to see where this new technology trend will lead us to. Hmmm this seems very useful. So many sites on here I want to check out now! !